Heat 2 tablespoons of the butter in heavy saucepan over medium heat. Toss in shrimp and cook until pink. When done, remove and set aside. Melt 1 tablespoon of the butter in the same pan over moderate heat, then cook the onion, bell pepper and artichokes until translucent. Add the salt and white pepper. Pour in the rice, stirring to coat it with oil. Pour the wine into the pan and turn the heat up to moderate-high, stirring gently to allow the rice to absorb the wine. After the wine evaporates, add stock in ½ cup increments and simmer while stirring, again until the liquid is nearly absorbed. Repeat for 15 minutes until rice is al dente, then remove pan from heat. Stir in Parmesan, remaining 1 tablespoon of butter and parsley, season with salt and pepper to taste. To serve, place a 2 inch, greased ring mold in the center of the plate. Add risotto and smooth out the top with an off set knife. Remove the ring mold and place two interlocking shrimp onto of the risotto timbale. Garnish with a single parsley leaf. While the Italians may have invented gnocchi, the French arguably perfected it with their love of soups and braises. This warm and comforting recipe features chicken, artichokes and gnocchi slow simmered in white wine and chicken stock. Topped with crème fraîche and fresh dill, the braising renders everything perfectly tender and mouthwatering. After making this dish the second time around, I found that using two 6-ounce jars of DeLallo Marinated Artichoke Hearts, drained and reserved about 4 tablespoons of the marinade and added it to the braising liquid, added instant flavor to this slow-simmered dish. I also left the skin on the chicken for more flavor in the dish.Although amazing as a stand alone main course, I also serve this dish with a rustic French bread and side dish of steamed asparagus. And as I think about it, this braised chicken dish, it reminds of the classic Southern dish, Chicken and Dumplings my Grand use to make when I was child. And while many of us are still waiting for Spring to begin and the snows to melt, this dish really hits the spot and is so filling with the lemony taste of dill. Rinse chicken and pat dry with paper towel. Peel onion and mince. Rinse dill and roughly chop leaves, discarding stems. Heat butter and olive oil in a large high-sided pan over medium-high heat. Season chicken all over with salt and pepper. When oil is shimmering, add chicken and cook until bottom is browned and lifts easily from pan, 3 to 4 minutes. Flip and cook until second side is browned, 3 to 4 minutes more. Remove chicken and set aside. Discard fat from pan. Add onion to pan from chicken over medium heat and cook until soft and translucent, about 3 minutes. Add white wine and chicken broth and scrape up brown bits from bottom of pan. Return chicken to pan, increase heat to high, and bring to a boil over high heat. Then cover and reduce heat to medium low. Braise, covered, until chicken is cooked through and pulling away from bone, 15 to 20 minutes. Remove, reserving liquid in pan, cover with foil to keep warm, and set aside. Add crème fraîche to pan with braising liquid and whisk to combine. Increase heat to medium high. Add artichoke hearts and gnocchi and cook, covered, until warmed through, about 3 minutes. Taste and add salt and pepper as needed. Return chicken to pan and turn to coat, about 1 minute. 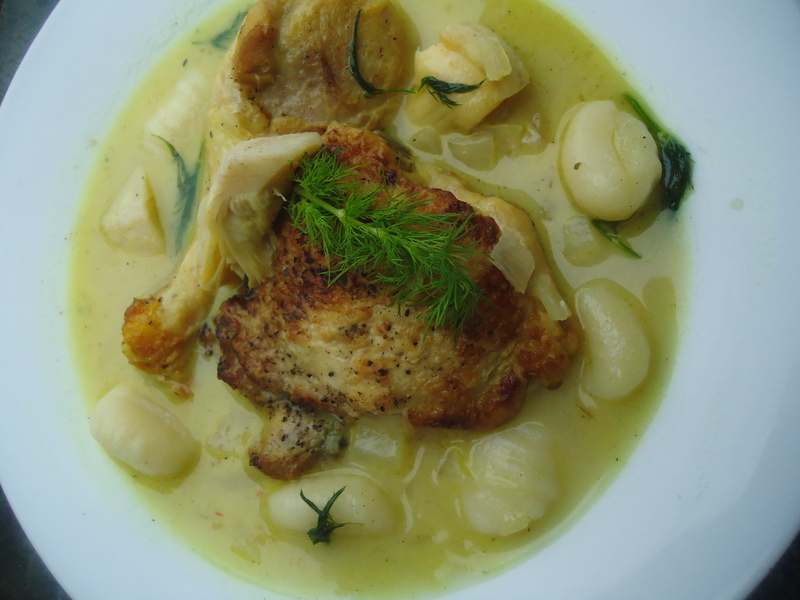 Divide chicken, artichokes, gnocchi, and braising liquid evenly between two pasta bowls. Garnish with dill and serve. Heat 4 tablespoons of the oil in a large skillet over medium heat; add garlic and cook for 1 minute stirring occasionally. Add the squash and sauté for 5-6 minutes on high heat until the squash is golden and crispy. Remove from the pan and set aside. Add the radicchio and vinegar, lower the heat and cook until wilted. Season with salt and pepper to taste. Cook the Pappardelle according to package directions and drain, reserving 1/2 cup of the pasta cooking water. Transfer the Pappardelle to the pan adding a little of the pasta cooking water to loosen if needed, then add the remaining oil and toss to combine. Add the fennel. Season with salt and pepper to taste. Divide among plates, garnish with chopped parsley and serve. Sprinkle with grated Parmigiano Reggiano cheese or grated Pecorino cheese if desired.